Russia backed Tunisia’s president, Zine El Abidine Ben Ali, until he fled to Saudi Arabia on Jan. 14, ending 23 years in power. In early February, as demonstrators massed in Cairo’s Tahrir Square, President Dmitry Medvedev telephoned Egyptian President Hosni Mubarak in a show of support. On Feb. 11, President Mubarak resigned, ending 30 years in power. Through June, July and August, Russian diplomats and commentators bitterly sniped at the NATO bombing campaign in Libya. Finally, on the eve of a Libya conference in Paris on Sept. 1, Russia recognized the rebel coalition, becoming the 75th country in the world to do so. 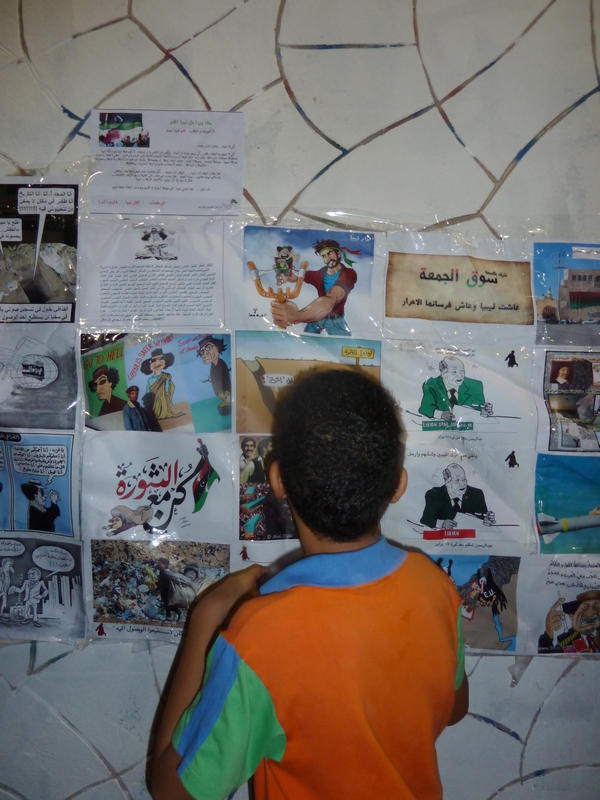 Even today, Duma members continue to publicly bemoan the overthrow of Moamar Gadhafi after 42 years in power. One would think that after backing losers in Tunisia, Egypt and Libya, Russia’s Foreign Ministry would have a rethink. In baseball, three strikes, and you are out. But Foreign Minister Sergei Lavrov is still at bat. And now he faces the fourth major uprising of the Arab Spring — Syria. Governments as diverse as those of Iran, Iraq, Turkey, Britain and the United States are all saying, to varying degrees, that the 41-year rule of the al-Assad family should come to an end. Over the last six months, according to a United Nations’ tally, President Bashar al-Assad’s security forces have shot and killed 2,700 protesters, including at least 100 children. Despite this slow motion, nationwide bloodbath, protests show no sign of subsiding. But when confronted about Syria, Russia’s foreign minister said on Monday that he opposes a U.N. Security Council resolution condemning the Assad regime. Instead, he called for dialogue between President Assad and the opposition. No one knows how Syria will play out in coming months. But one thing is clear: Russia will emerge as a much reduced player in the Arab world. Until this year, Russia’s has had disproportionate influence in the Arab world, largely due to the momentum of old Soviet relationships and arms deals. 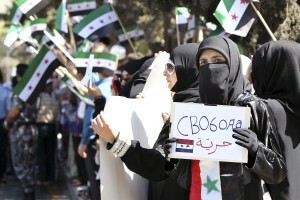 Now, Russia’s Arab friends are in hiding, in exile or on trial. After clinging to aging autocrats, Moscow now faces a steep, uphill battle to rebuild influence among new elites. The new powers in Tunis, Cairo and Tripoli clearly recall which side the Kremlin took during the revolution. Moscow’s reactionary foreign policy reflects a deep, widespread conservatism in Russia today. As Russia’s population ages and shrinks, many people are skeptical of the youth-led revolts of the Arab world. In American terms, the 2011 Kremlin is like the 1968 White House: Richard Nixon surrounded by a conservative staff of World War II veterans appalled and mystified by the youth revolts going on around the world. After a disastrous 20th century, many Russians still accept the conservative offer made in 2000 by then-candidate Vladimir Putin – peace and quiet and reasonable economic growth. For many Russians today, the word “revolution” provokes cynicism at best — hostility at worst. On a visit to the Kremlin, I once asked Dmitry Peskov, press secretary to then Prime Minister Putin, why Moscow’s riot police devoted so much energy to beating up and arresting “NatBols” – the National Bolshevists who showed up at demonstrations waving revolutionary red and black flags, often tied to sturdy sticks. MOSCOW. Sept 22 (Interfax) – ‘The Arab spring’ has changed the Middle East and North Africa, which entered a period of transformations, Russian Foreign Minister Sergei Lavrov said in an interview posted by the Wednesday issue of the newspaper Rossiyskaya Gazeta. “In light of the recent events in Tunisia, Egypt and later in other countries the Middle East and North Africa region has since early 2011 been undergoing a cardinal transformation. 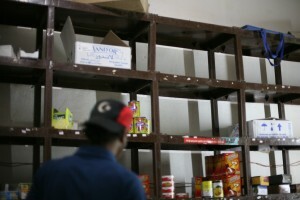 What’s happening is in fact a change of regimes and practices that took shape back at the time of gaining independence by the peoples of those countries, the desire of popular masses for greater democracy, higher living standards and welfare, and unhindered access to universal human rights,” the minister said. “In our estimation, these processes won’t be easy and the development of events isn’t going to be straightforward, of which there is already ample evidence. It is undoubted that the changes will have far-reaching consequences, resulting in an entirely different countenance of the region. We are sympathetic to the aspirations of Arab peoples and their desire to live better and we believe that they themselves can and should determine their own destiny. “So we are fundamentally opposed to interference in internal affairs, the imposition from the outside of ready-made development precepts and scenarios. It is important that the concepts of democratic reforms should be generated by the peoples of the Middle East and North Africa themselves with due respect for their civilizational traditions from outside players. “Our fundamental interest is to see the Middle Eastern states stable, prosperous and developing along a democratic path. In the present circumstances the main task of the international community should be to help reforms in the Middle East, the elimination of threats emanating from the region to international stability and security, and the settlement of longstanding conflicts. “Russia, given its close historical ties with the region, is ready for such work. We will continue to build our relations with the countries of the Middle East and North Africa based on mutual respect and reciprocally advantageous cooperation. These relations rest on a solid foundation, underpinned by decades of mutual friendly feelings of the peoples, rather than a momentary conjuncture,” he said. 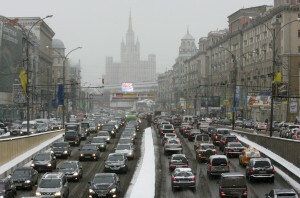 On Saturday afternoon, Alyona, a 28-year-old economist friend, was crossing a wide avenue by Universitet Metro station, near the Moscow State Circus. There was not a traffic light, just black and white zebra stripes indicating a pedestrian crossing. On each end of the crosswalk were two blue and white pedestrian crossing signs, now familiar warnings to drivers in Moscow. Three meters in front of Alyona, a woman was crossing the avenue with her five year old son. An old Zhiguli car sailed through the crossing and knocked her flat on the asphalt. The driver, a free-lance cab driver from the Caucasus, apparently did not know that pedestrians have the right of way over cars in Moscow cross walks. Within five minutes, a police car was on the scene. Within 10 minutes, an ambulance was there. Within 15 minutes a helicopter touched down. Quite an impressive scene for Alyona, who spent the next three hours calming, consoling, and amusing the traumatized five year old. Finally, his father arrived at the hospital. It seems that his wife would pull through. Several hours later, John, an American businessman friend, was driving a girl friend to the Metro after a movie. He rumbled down a cobblestone street in Zamoskvoreche. 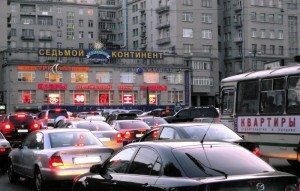 This old, largely residential neighborhood across from the Kremlin is served by the last tramway line in central Moscow. Impatient with a lumbering tram, he wheeled his SUV around the tram, across the tracks and back to the bumpy cobblestones. Three traffic police appeared out of the shadows, their yellow vests suddenly reflecting the headlights. One strode into the street and waved his white baton, signaling the offending driver to pull over. After a perfunctory salute, he rattled off chapter and verse of the violation: overtaking a tram. His recitation then slowed to stress the final point. Penalty: loss..of…drivers…license… for… 4…to…6…months. The policeman started writing down the driver’s particulars on an official form. John, who speaks reasonable Russian, commented a bit lamely that there are very few tram lines in the United States. 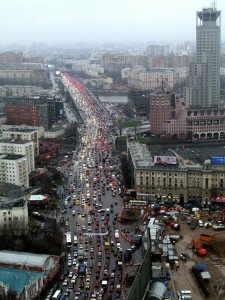 The traffic officer suggested that he look up Moscow traffic rules on the internet. A version is posted in English. Feigning naiveté, John asked if the ‘straff’ – or fine – can be paid on the spot. The officer asked John to step out of the car, out of earshot of his date. “Do you drive much in Moscow?” the officer asked. “No, 5,000 rubles,” the officer said, citing the equivalent of $170. The next day, John recounted the encounter in detail. He justified the payoff as follows: He broke the traffic rules. He would have had to pay a fine anyway. Instead of paying it to the government, why not pay it directly to the traffic officer? How does the government expect an officer to support a family in the world’s most expensive city on a monthly salary of $1,000? (On Sept. 21, Russia’s Cabinet approved a 2012 Federal budget that is to double all police and military salaries). Aside from the fact that not all Americans are Boy Scouts, what lessons can be drawn from Saturday’s traffic tales? First, as a result of Russia’s oil and gas boom, most of the population of Moscow, now the largest city in Europe, is from somewhere else. Second, modern Russia has a foot in two worlds. An ambulance helicopters to an accident caused by an unregistered taxi driven by a migrant worker, unfamiliar with the city and the language. Finally, five blocks from the bright lights of Red Square, traffic police lurk in the shadows, waiting to shake down drivers in order to make up for their poverty level pay. Almost 1,000 years later, Georgia’s newly elected leader, Mikheil Saakashvili, took his oath of inauguration at the tomb of David the Builder. Since then, President Saakashvili has had mixed success bringing wayward provinces under Tbilisi’s central control. But he has had more success putting his architectural stamp across his nation in the Southern Caucasus. Georgia’s American-educated president is shaking up a complacent country, a place that seems like a patch of rural Greece transplanted 1,500 kilometers east to the far shores of the Black Sea. On a nearby hillside, he has erected a Greco-Roman Presidential Palace, a new city landmark because of its tall, egg-shaped glass dome. Near the airport, visitors drive past a wavy, all-glass Interior Ministry. For Kutaisi, Georgia’s second largest city and future legislative capital, President Saakashvili is building a $35 million new Parliament building that looks like a concrete and glass armadillo. In Batumi, Georgia’s tourist capital, so many zany shaped buildings are rising for hotels and restaurants that some critics cry kitsch. And strung along an east-west highway joining these cities is a series of see-though police buildings. By using glass for government buildings, the Georgian leader seeks to put into three dimensional form his drive to bring transparency to a nation long ruled behind closed doors. Most nations have two classes of air travel: economy class and business class. Russia has two categories: safe class and crash class. Today, Russia mulls lessons learned from last week’s crash that killed 44 hockey players and coaches from Yaroslavl. It is the worst sports aviation disaster worldwide in a generation. On an absolute level, Russia now has the world’s worse air safety record, topping the Democratic Republic of Congo. (Think Zaire). 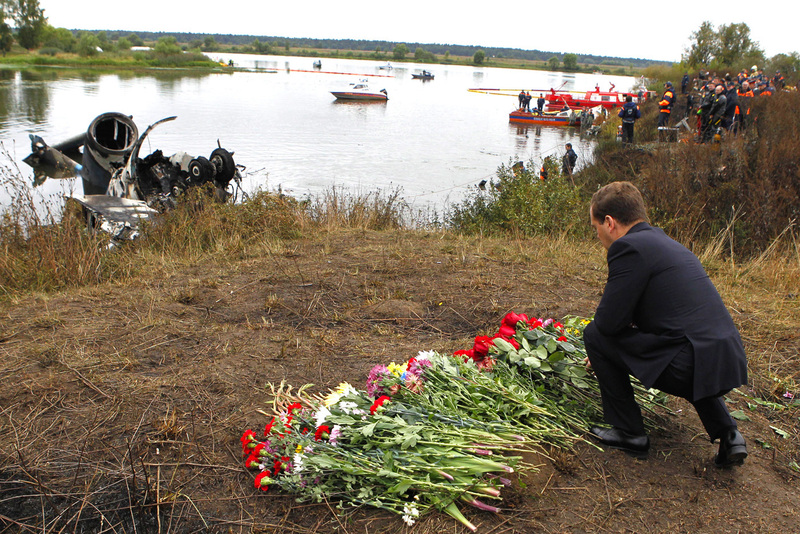 This year, seven airplane crashes have killed 121 people in Russia. In the Congo, three crashes this year have killed 106 people. However, Russia has far larger volume of air passengers than the Congo – about 60 million for Russia this year. But the air crash rate for Russia and the Commonwealth of Independent States is now 7.5 crashes per 1 million flights, or three times the world average, according to the International Air Transport Association. Burrow down into the statistics, and you will see emerge a two class system. Last year and so far this year, all of Russia’s fatal crashes have involved Soviet-designed passenger aircraft. Take these Soviet-era planes out of the equation, and Russia’s commercial air accident rate for the last two years falls to zero. Russia today has 130 airlines. The top 10 carry 85 percent of passengers, overwhelmingly on Western-made Boeings and Airbuses. Looking only at Russia’s top 10 airlines, Russia’s current air accident rate again falls to zero. The challenge for Russia is to supply safe air service to the largest country in the world. After a two decade dip, air passenger traffic in Russia is finally returning to the levels of the last days of the Soviet Union. 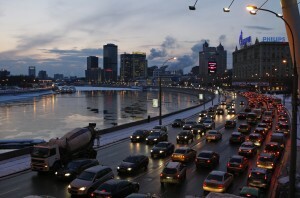 This year, the number of air tickets sold represents the equivalent of 40 percent of Russia’s population. Russia’s 120 small airlines provide services to smaller cities and regions, areas that would be literally marooned in this continent of forest and snow. World class safety rules and inspections that are now the norms in Moscow and St. Petersburg often do not reach regional airports and airlines. In addition, smaller airlines are often run by post-Soviet entrepreneurs who take shortcuts on safety to maximize profits. Tales abound of small air companies that skimp on pilot pay and training and that fine pilots for cancelling flights, for using too much fuel, or for not landing on the first try. This breed of air company executive flies planes until they crash. I saw the results of this kind of entrepreneur years ago when I worked in Zaire. Across Central Africa, the edges of landing strips were littered with carcasses of planes that were flown until the ends of their useful lives. experience. Yak-42s have a seating occupancy of 120. But this flight carried only 42 passengers. But even with only one-third its passenger load capacity, a three kilometer runway, and three working engines, the aging Yak was unable to gain altitude. After the end of the runway, it fatally clipped a radio navigation beacon. The 18-year-old plane was scheduled for “heavy repairs” later this year, according to Igor Levitin, Russia’s Transportation Minister. In 2009, the European Aviation Safety Agency ranked Yak Service as the least safe of 35 Russian airlines flying to Europe. That ranking prompted the EU to ban the company from flying to Europe. To turn around Russia’s air safety picture, President Medvedev has ordered bureaucrats to speed up existing plans to cut the number of Russia’s airlines. Recognizing that Russia’s aircraft industry is decades away from meeting airplane demand, he is cutting incentives for Russian companies to buy Russian-made planes. With Russian air travel increasing by 12 percent this year, Boeing estimates that Russia and the countries of the former Soviet Union will buy 1,080 passenger aircraft over the next 20 years. coffins of 19 players were placed on Lokomotiv’s Arena 2000 rink, a space where only two days earlier Mr. Medvedev had presided over his annual international political conference. 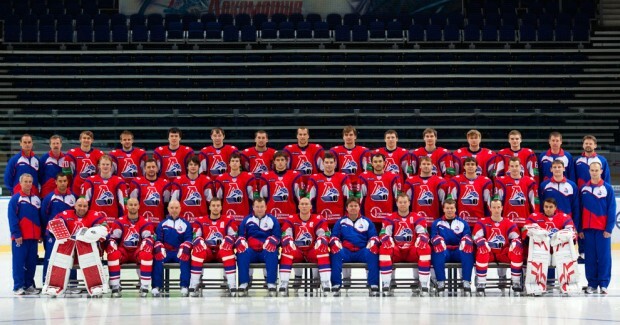 Because of the conference, Lokomotiv was forced to charter a plane to play its season opener out of town, in Minsk. On the Russian blogosphere, some fans are speculating that confusion at the regional airport on the first day of the conference, traditionally the airport’s busiest day of the year, contributed to the fatal crash. In a nation where a lack of government transparency allows conspiracy theories to flourish, this question mark is bound to hang in the air for years to come. Some readers have complained that Russia Watch recently has been all about Libya, which has nothing to do with Russia. 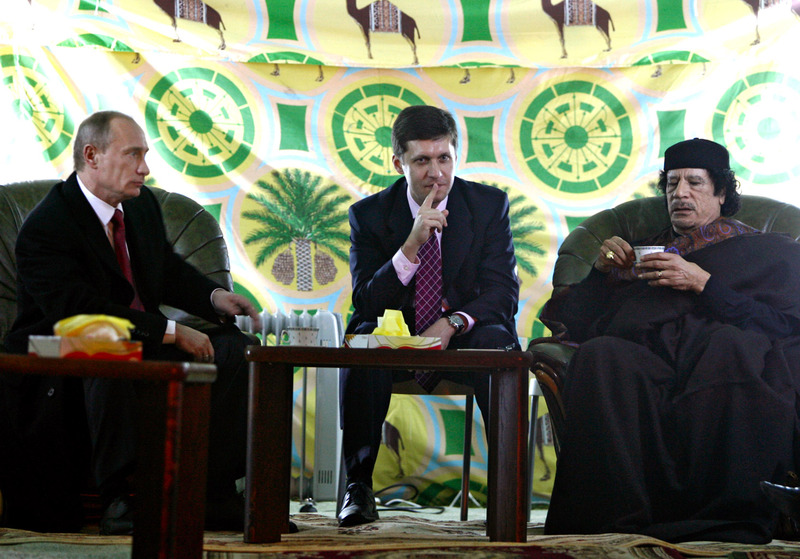 Once a big player in Libya, Moscow will now be a bit player in Libya. In 1969, the Soviet Union took a quick shine to Moammar Gadhafi, extending diplomatic recognition only three days after his Sept. 1, coup. Fast forward to Sept. 1, 2011. On that day, Russia extended diplomatic recognition to Libya’s National Transitional Council, becoming nation number 73 on the list to do so. In the intervening 42 years, Moscow and Moammar were often an item. Jowly Leonid Brezhnev accurately thought he could do business with the then jut-jawed Libyan Colonel. In 1974, after the West hit Libya with an arms embargo, the Soviets saw their chance, jumping in to sell combat jets, tanks, frigates and anti aircraft systems. By 1980, Moscow had a 3,500 advisors in Libya, and Libya’s arms purchases accounted for 10 percent of Soviet hard currency earnings. As files from Libya’s secret police now reveal, East Germany gave valuable assistance to Col. Gadhafi in setting up a ruthless domestic spying agency, one that long outlasted its East German mentor. The transition from Soviet Union to Russia was rocky. Moscow put all deals on a commercial basis, and demanded a settlement of Libya’s Soviet-era debt of nearly $5 billion. In 2008, the debt was waived in return for business contracts. Driving down Tripoli’s Corniche the other day, I saw a sun-faded billboard touting one of the biggest – a $3 billion deal for Russian Railroads to build a high speed, double track rail line from Benghazi west to Sirte, Gadhafi’s home town. In other projects, Russia’s Tatneft has drilled wells in Gadames and it has licenses around Sirte. Gazpromneft was negotiating to take part in a large oil field, appropriately named Elephant. In reality, the new government will probably honor existing contracts. The railroad will probably go ahead as it is part of a larger project to connect Cairo and Morocco by rail. China is building the rail portion west of Sirte, toward Tripoli. But, there is no glory in being 73rd on the list of Libya’s favored nations. 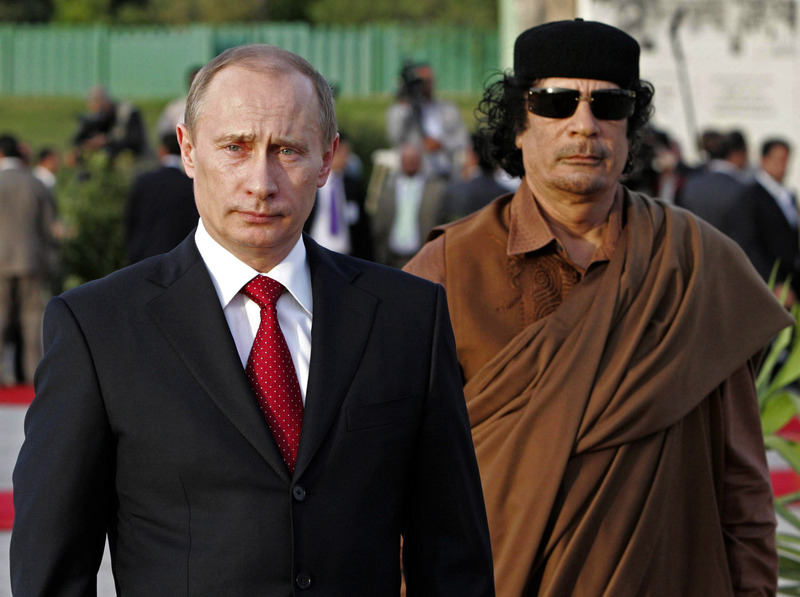 Libyans now associate Moscow with their Gadhafi past. It is unlikely the new government will do Russia any favors. To Russia’s benefit, the country is now largely off the radar screen in Tripoli. President Medvedev over the U.N. resolution authorizing NATO to act here was big headlines in Moscow, but was largely ignored in Libya. 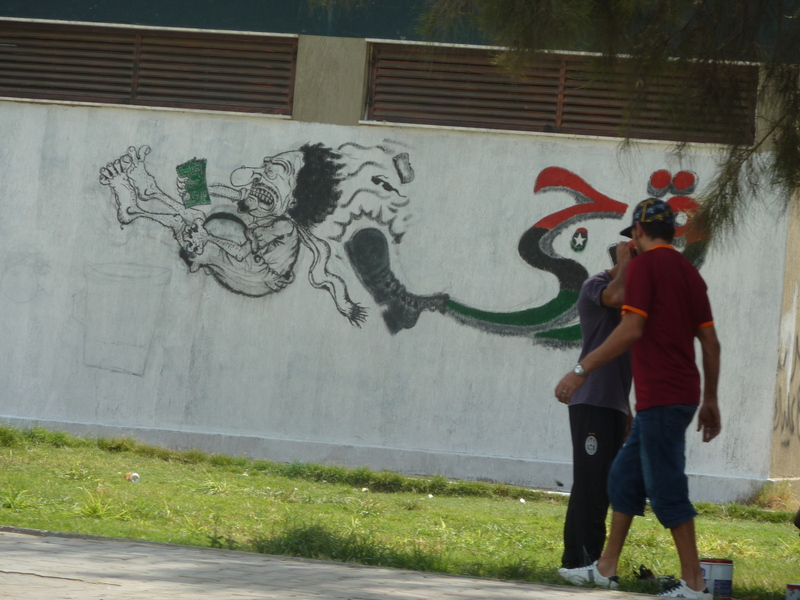 Libyans are thinking about Italy, France, Britain and the United States, not Russia. 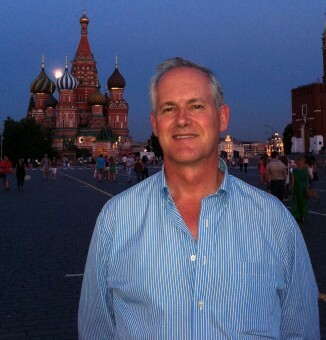 After 10 days in Libya, the only time Russia surfaced was when I slid into my airplane seat from Tunis to Moscow. Sitting next to me was a young Libyan man, a fourth year kursant, or cadet, at a Russian military school. He said he had been home for July and August. I asked him what he thought about the revolution. “Gadhafi only lost because of the NATO bombing,” he said earnestly in Russian. On one level, he seemed to be practicing lines that would be a hit with his Moscow instructors. On another level, I realized he was kind of out of it. His priorities were the 40 apps on his i-phone, buying a duty free luxury watch on the airplane, and getting back to Moscow nightclubs to check out the devochkas. I asked him about the future. He tapped his shoulder, winked, and said that on graduation in June, he would become an officer in the Libyan Army. I translated from French, a headline in a Tunisian newspaper, saying that Libya’s new leaders are planning to form a new national army. By all accounts, defense spending in Libya will decline as the nation slows arms purchases, and reorients spending to health and education. 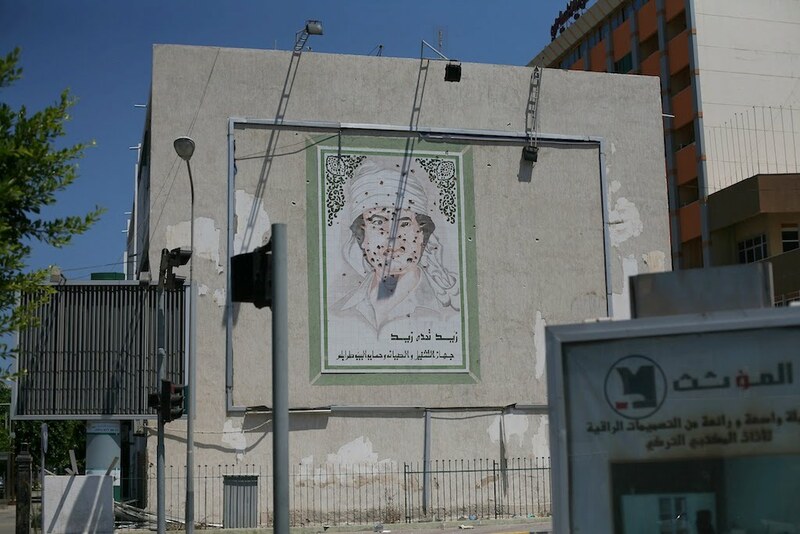 Unlike Mr. Gadhafi, the emerging leadership in Tripoli shows no interest in waging wars on its neighbors or picking fights with the Europe and the United States. For example, the $850 million contract the Gadhafi government signed earlier this year for Russian anti-ship missiles can be expected to sink below the waves. As our Airbus droned east into Russian airspace, I wondered silently if a Libya rebel unit leader, after six months of fighting, would give up a plum officer’s commission to a young man who sat out the revolution ogling girls in Moscow nightclubs and playing video games in his parents’ house in Tripoli. I had another hour to go in the confines of Seat 4B. I decided to keep those thoughts to myself. Arm chair generals watching Libya from afar ask: why are the rebels dragging their feet in attacking Sirte? 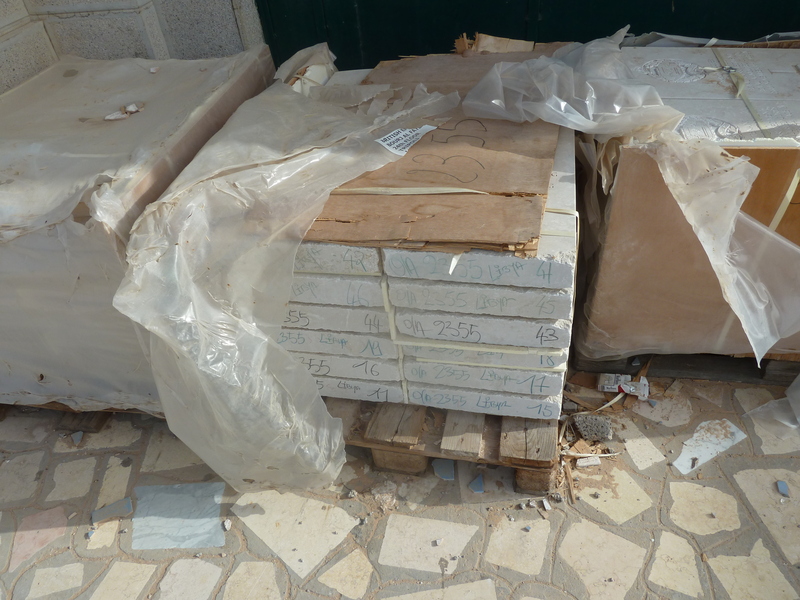 The birthplace of Moammar Gadhafi, this Mediterranean seaport is the last holdout of Gadhafi loyalists on the coast between Tunisia and Egypt. Last week, after losing control of Tripoli, Gadhafi proclaimed Sirte to be the capital of his Great Socialist People’s Libyan Arab Jamahiriya. Rebel columns now surround Sirte. But they have given city and military authorities 10 days to negotiate a surrender of the city. The deadline is now Sept. 10.
patience. 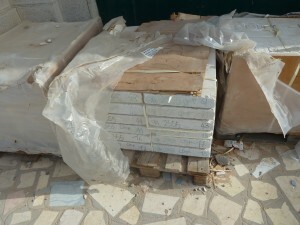 I hunted down the Tripoli War Cemetery, a little visited reminder of World War II that lies largely forgotten behind apartment blocks in Tripoli’s Mansour district. I went there because my father, John L.B. “Jack” Brooke, drove an ambulance during the North African campaign, essentially from Cairo to Tunis, passing through El Alamein, Tobruk and Benghazi. A volunteer for the American Field Service, he was attached to the British 8th Army. 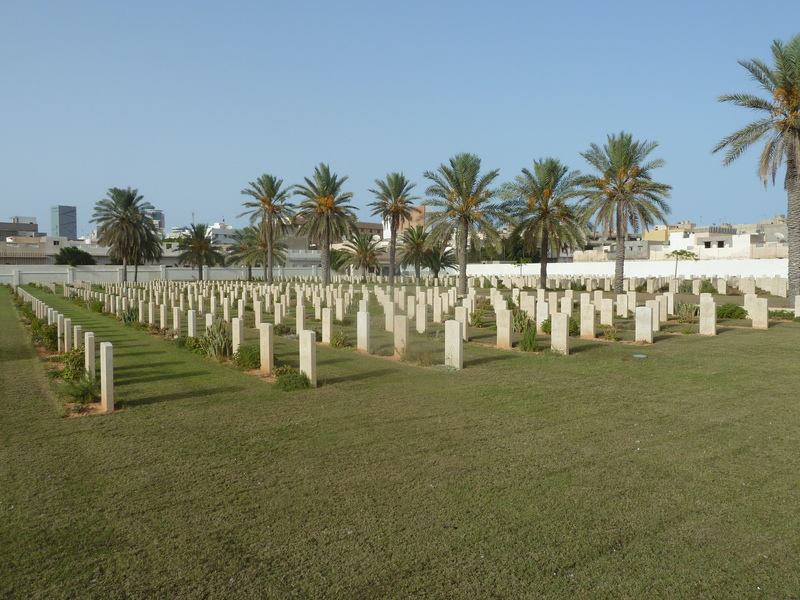 Most of Commonwealth soldiers buried in the cemetery came from military hospitals set up in Tripoli after it was liberated from German-Italian forces by the 8th Army on Jan. 23, 1943. 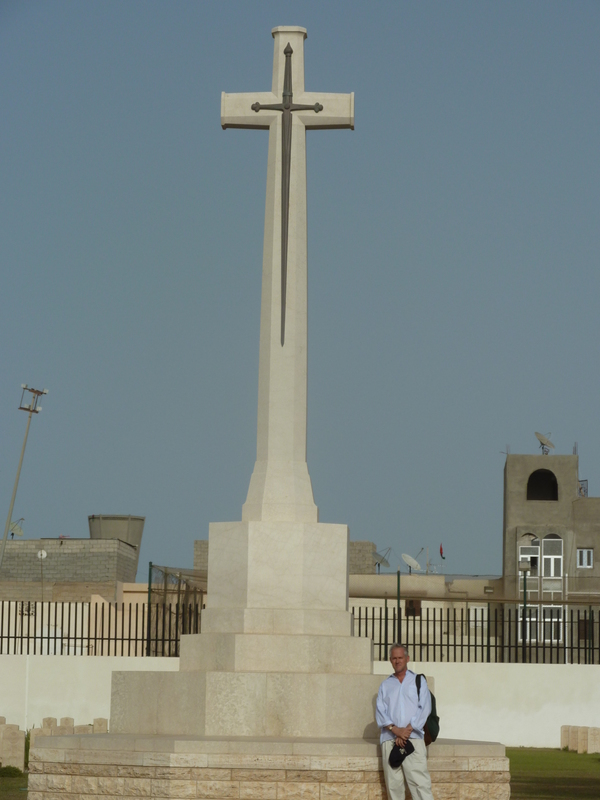 Undoubtedly, some of the men buried here passed through the back of my father’s ambulance. The cemetery is well maintained, with drought resistant dull green grass that crunches underfoot. 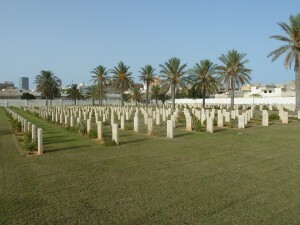 Date palms provide islands of shade in a sea of 1,369 tombstones — row upon row of sun-baked stones, honoring young men from Britain, Sudan, India, and South Africa. To ponder these rows of stones is to glimpse lives cut short, weddings canceled, children never conceived, children who never knew their fathers. 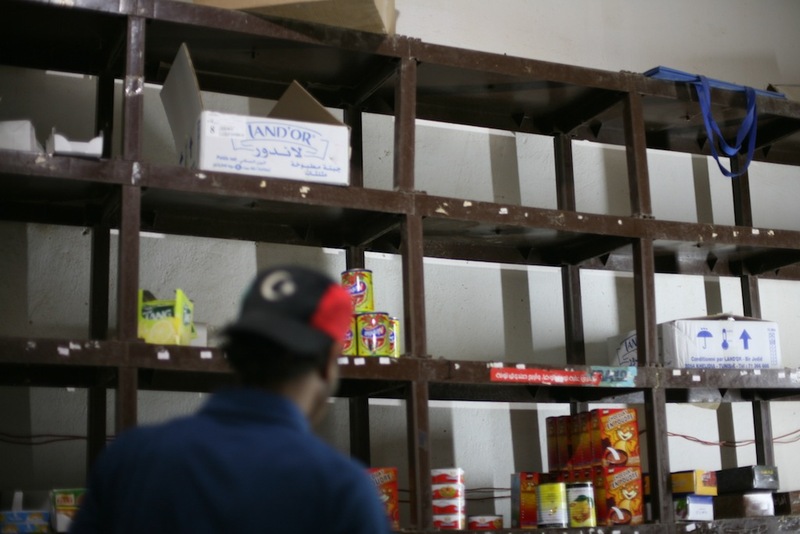 This year, Libya has lost an estimated 50,000 men in its six month revolt. That is a staggering amount in a sparsely populated desert nation of only 6.4 million people. Libya’s uprising was a bloody, city by city revolution — not an urban riot over high bread prices, not a surgical military coup. To the west, Tunisia, with twice Libya’s population, lost only 224 lives in its January revolution. 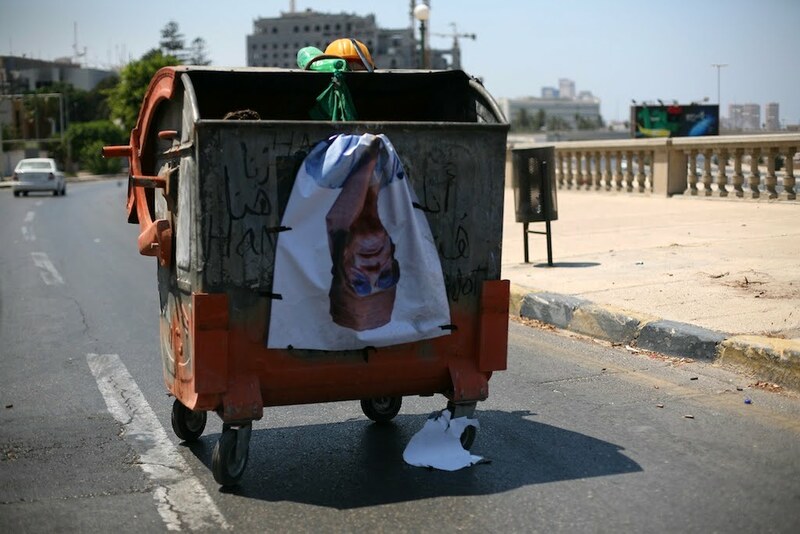 To the east, Egypt, with 10 times Libya’s population, lost only 846 in its February revolution. In American terms, Libya’s fatalities would be the equivalent of 2.4 million lives lost in six months. But no, rebel leaders do not want more lives lost in Libya’s costly civil war. that Moammar Gadhafi was crazy. There were, of course, hundreds of newspaper cartoons the world over. But generally, the public fiction among grownups in the West was to assert the leader of the nation that controlled the largest oil reserves in Africa was, well, a little eccentric. 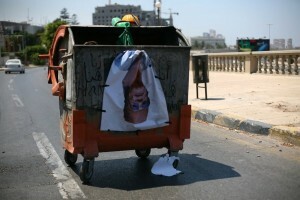 But now Libyans are saying that the emperor has no clothes. rolling by as a red, black, green and blue blur. 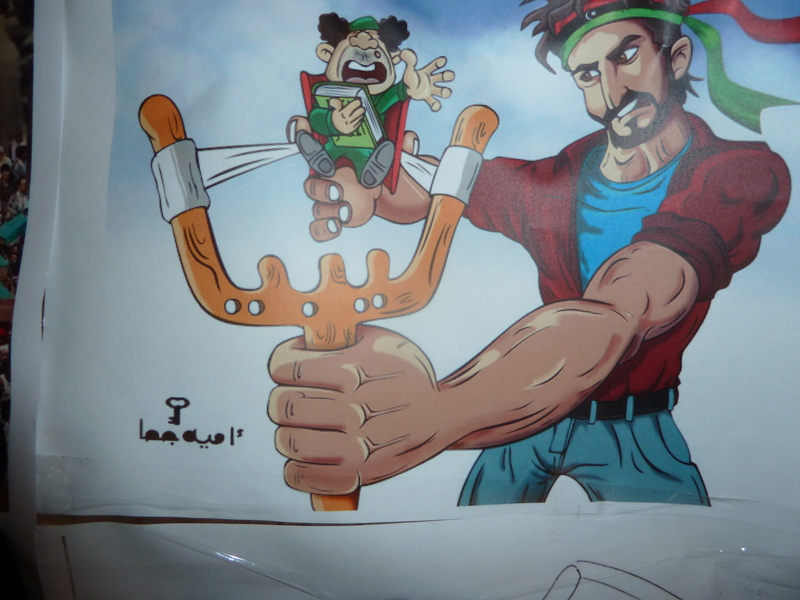 But caricatures jump across language barriers. There is only one man caricatured. To portray Libya’s wigged out leader, the key is the frizz under the fez — the hairdo. hirsute rat down to a ‘safe’ tunnel. On family night, a girl-led sound truck rolled through the streets Tripoli. 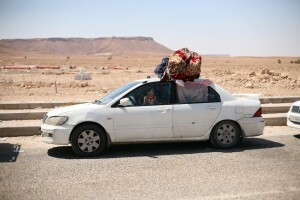 The next day, my taxi rounded a city corner, and I suddenly found myself face to face with Libya’s real women. A laughing, giggling parade of women and children was coming down a side street in the Medina. Like female pied pipers they drew more and more followers as families tumbled out of apartments and high walled compounds. There were chic young girls in lipstick, designer sunglasses, and big smiles as they walked arm and arm. There were traditional grandmothers, taking excited grandchildren by the hand, and ululating as if they were back in the oasis. Driving back to the Radisson Al Mahary hotel, my taxi driver patiently threaded his way around more and more knots of women and children gathering on street corners. They all were preparing to walk in the same direction. 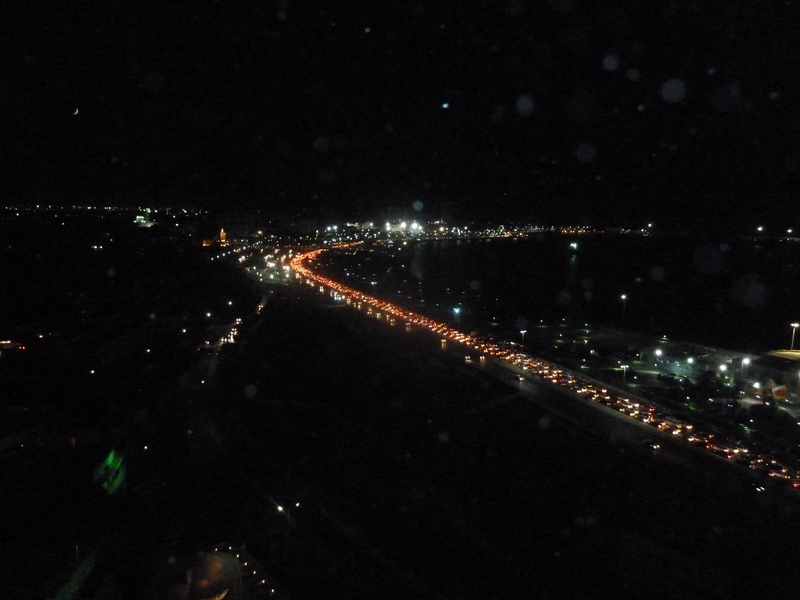 From my 13th floor balcony in the Radisson, I saw the same phenomenon – times 100. Stretching down the Corniche, Tripoli’s ocean side boulevard, traffic was a long, thick red smear of tail lights – four lanes wide and kilometers long. 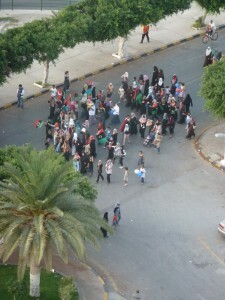 After Friday afternoon prayers, everyone going to Martyrs’ Square. Fighters were told to stop firing their guns in the air. It was family night on the square, down in the Medina. 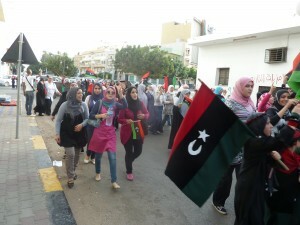 Singing the nation’s new anthem, tens of thousands of women and children gathered around a block long banner in the red, green and black colors of Libya’s new rebel flag. Bounded on one side by a massive, ancient wall of the Red Fortress, the square was created during the Italian colonial period. It was then called Piazza Italia. After Independence in 1951, it was called Independence Square. After Col. Gadhafi seized power, in 1969, he renamed it Green Square, after the color of his revolution. speeches, often containing pronouncements that would echo around the world. But Friday night, a banner in the colors of the rebel flag hung from that iconic balcony. 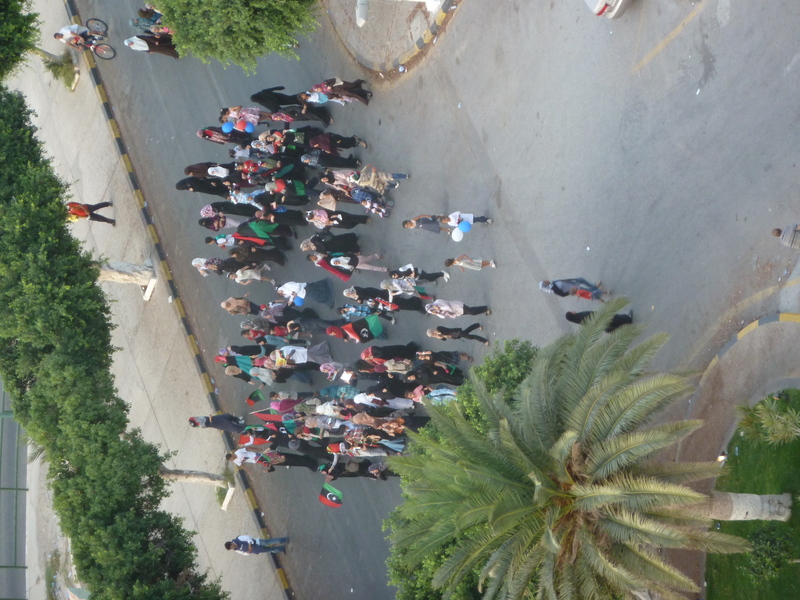 The morning after, it would be common journalistic practice to report that Tripoli’s women and children turned out en mass in defiance of Moammar Gadhafi. 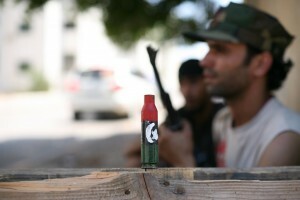 The family night celebration took place only 24 hours after Gadhafi promised to drown the streets of Tripoli in blood. But it would be more accurate to say that the women blew off “Brother Leader” as yesterday’s man, a blowhard out of touch with reality, sending blustering, poor quality audio tapes from a secret desert hiding place. In journalism,”dumb” questions often get smart answers. 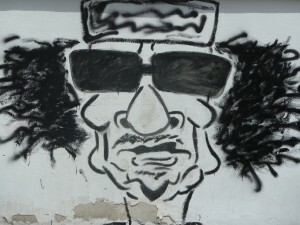 Moammar Gadhafi or his politically ambitious sons can one day make a comeback. People look at me with incredulity, as if the foreigner has a learning disability. Impossible, never, he is a criminal, are some of the responses. Rajeb Alghriani believed the solution was to talk loudly. He was helping his son clean up a burned out police station next to his house. And a comeback for the Gadhafi clan? 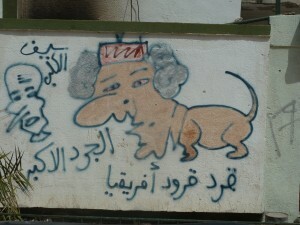 “Yahia Gadhafi — Up with Gadhafi” – only one month ago? 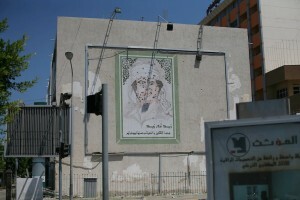 “In Tripoli, people said ‘Long Live Gadhafi’ because they were scared. 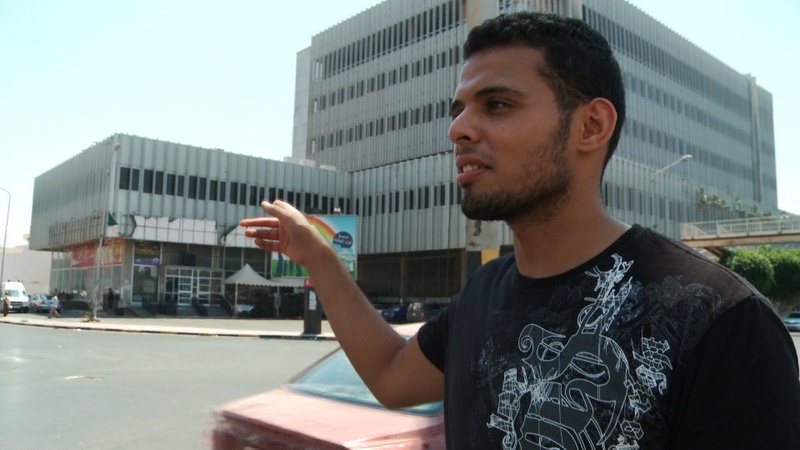 The same question went to Mohammed Abou Gabha, who was manning the checkpoint. Although aged 21, he had a wiser understanding of how to survive under a dictatorship than some people three times his age. On my audio recording, his voice jumps off the tracks: “You are TV guys, right? as a militant, aggressive nation at war with Europe and the United States. a mellow Mediterranean people with great smiles and hospitality. I have passed through 100 checkpoints on the strength of my Western face. “America — good”, armed young men say, waving me through checkpoints. 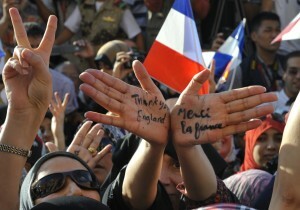 They apologize for their rudimentary English, saying that Gadhafi wanted to keep them isolated from the world. destiny – as a Mediterranean nation.